GLTI.CH KARAOKE TO SUPPORT THE JAPAN SOCIETY TOHOKU EARTHQUAKE RELIEF FUND! Defy human spacetime by telepresently warbling the tunes of Elvis, the Spice Girls, and the Beat Crusaders with friends in London AND Kumamoto at the Meanwhile Space at the End of the Universe (aka Whitechapel) with the power of Skype, YouTube karaoke vids, hand-me-down computers, and a mutual love of amateur live singing. Free to attend, donations encouraged. There will be drinking and singing, but no pressure to do either. WHAT ON EARTH IS GLTI.CH KARAOKE? 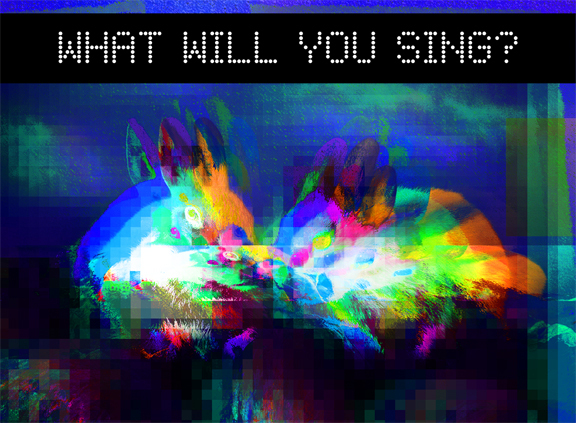 GLTI.CH KARAOKE is a hybrid spactasic jukebox oozing with time-delayed, glitchy fun. In the first ever GLTI.CH KARAOKE event, we will open a live web-streamed sing-off to end all sing-offs (for now) between Kumamoto, Japan and London, England. Kumamoto residents will virtually join Londoners GLTI.CH KARAOKing in Meanwhile’s underground space where the eight hour difference between Japan and the UK will vaporize into meaninglessness so long as the interwebs keep running and the participants keep singing. If you have a favourite song you’d like to be GLTI.CH KARAOKEd, send us the YouTube video or post it here. Language is no barrier–just as long as you can find it on YouTube, we’ll try to sing it!